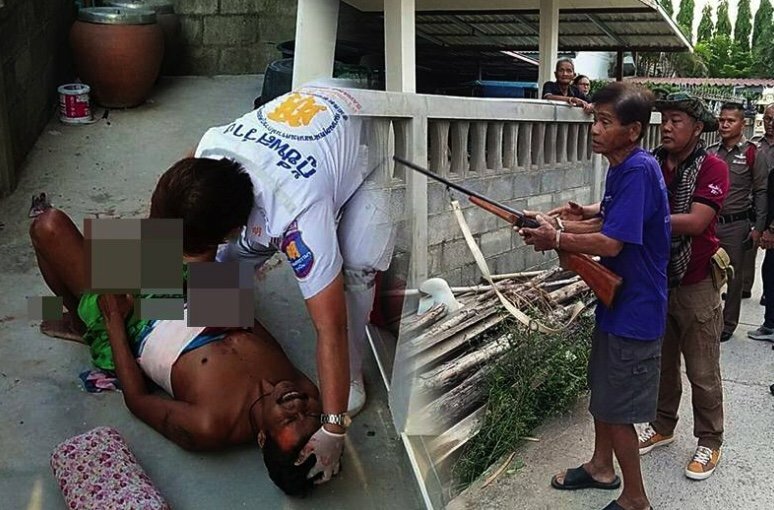 Soon Nern police in Nakorn Ratchasima have charged a man in Maklua Kao village with attempted murder after he thought his best mate's son had stolen 47,900 baht from him. Nikom Makong, 74, thought Tawee Srijantheuk had robbed him after a drinking session on Monday evening. But Nikom's son later found the money under his dad's pillow. Soon Nern police were called to a house in the village yesterday morning where Tawee was lying grievously wounded. His intestines were coming out and he was rushed to a local hospital thence to Maharat Hospital in Nakorn Ratchasima. Police quickly learned that the shooter was neighbor Nikom. The victim's father Bunnark Srijantheuk related the scarcely believable story of what transpired. On Monday evening Nikom - his best mate and neighbor - had come round to say that he had got 48,000 baht from the sale of his rice crop. He gave a 1,000 baht note to Bunnark's son to go and buy a bottle of lao khao (white spirit) to celebrate. Tawee returned with the alcohol and returned the 940 baht change to Nikom. Then a drinking session began. Nikon got so paralytic by the end of the session that Tawee had to virtually carry him home to his house and bed. But when dawn broke on Tuesday Nikon came over in a fury claiming that his money was gone and that his son had stolen it. He said just 40 baht was in his wallet. He demanded to know where was the other 47,900 baht. Tawee said that it was all ridiculous - why would he steal from a man whom he considered as much as a father as his own. But Nikom would not be placated. After Bunnark got annoyed with his protestations and said he should go to police he went back home to his house in a mad fury and got a gun. When he returned to his house Tawee tried to calm the situation down but was shot in the abdomen. Police arrested Nikom and took him in. Shortly afterwards, however, the son of the suspect arrived at the police station. He had found the missing money - all 47,900 baht of it - hidden under the old man's pillow. But it was too late to take back what had happened, reported Daily News. Nikom had already been charged with attempted murder. Who in their right minds bring 47,900 baht to a "drinking session"? Not loong, he left it under the pillow. But he did bring his gun. guns and alcohol-perfect together! lol. i take a page out of the american nra book-how dare you people of the media report on this tragedy-you have got no class and your godless lol. My gut (which is still on the insides) thinks that it was his own son that had the money and then "put it" under the pillow now that it is all in the hands of the police. Just a silly theory, but putting money under a pillow really is only done by tooth fairies. He gave a 1,000 baht note to Bunnark's son to go and buy a bottle of lao khao (white spirit) to celebrate. Tawee returned with the alcohol and returned the 940 baht change to Nikom. Then a drinking session began. Nikon got so paralytic by the end of the session that Tawee had to virtually carry him home to his house and bed. On 60 bahts worth of booze. Wow they are cheap dates. Hope the old man enjoyed his last drink.... he won't be out in time to spend the rest of his money ! If he didn't have a gun it would probably have been the machete. Just another complete dummy with access to a gun while drunk. How much will the cops take in this divine miraculous catch of fish ? The drunkard is a danger to society and sadly must be locked away either in a hospital or in jail. suppose if you are pissed,but even when sober they don't stop and think. I think 47,900 baht payment to the victim and an I'm sorry will make this all go away. And on what basis of FACT do you base your assumption?? Fact beyond reasonable doubt, the proof required under English law to secure a conviction.